Excellent facilities for skiing, a historic city and authentic Tyrolean atmosphere: these are some of the reasons to visit Kitzbühel, Austria. Kitzbühel, a picturesque city situated in the Tyrolean Alps between the peaks of Hannenkam and Kitzbüheler, has gained a reputation as one of the prettiest alpine ski resorts on Earth. Perched above an eight-century-old town with cobblestone streets, the belt of sparsely forested and diverse peaks interlaced with ski gondolas and cable cars rising to 2000 meters above sea level. This world-renowned Tyrolean ski resort first acquired fame thanks to the spectacular Streif, one of the most exhilarating downhill slopes in the world, and also site of the annual World Cup alpine competition. Skiing has become a way of life here – the pastime goes back more than 120 years. Kitzbühel is the oldest winter resort in Austria, with a touch of exclusivity compared to other neighboring resorts. 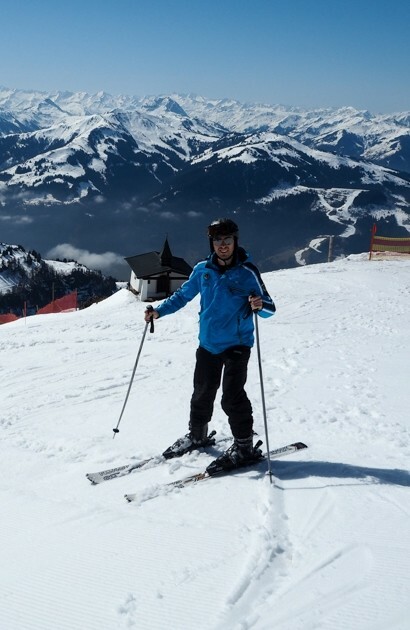 During a prolonged spring weekend, I got the opportunity to visit Kitzbühel and try out its legendary slopes. 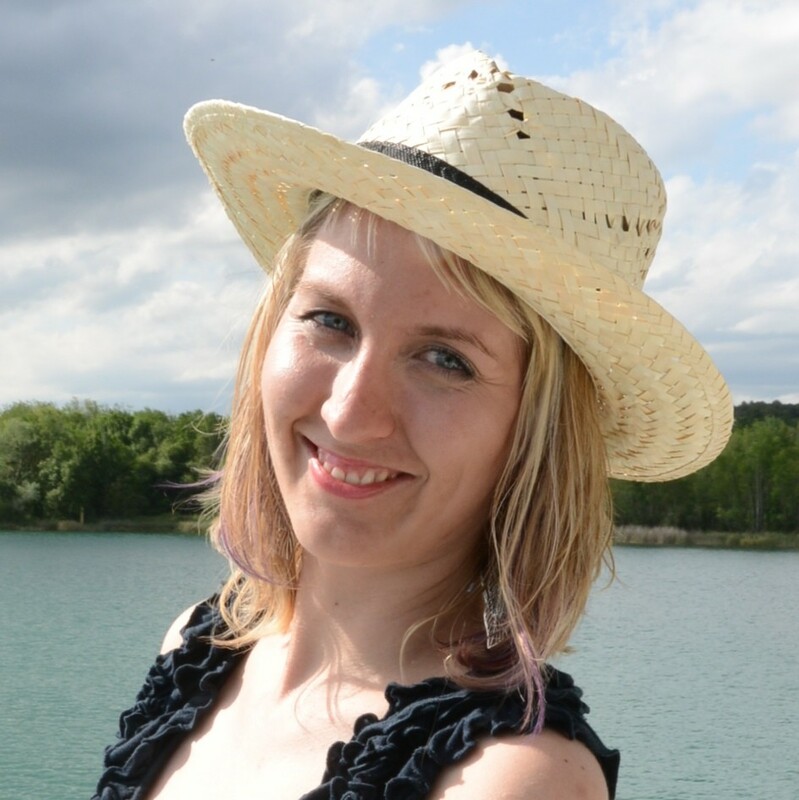 I was really lucky with the weather – it was so sunny I could actually use the skiing breaks for sunbathing and revel in the awesome spring atmosphere! There are three airports to choose from: Salzburg, Innsbruck or Munich. Use Kiwi.com, my favorite flight search engine, to find the cheapest place. The last part of the trip has to be overland: you can take a bus from Munich or shared minibus transfers from all three the airports. The trip takes about one hour from Salzburg or Innsbruck, or a little over two hours from Munich. 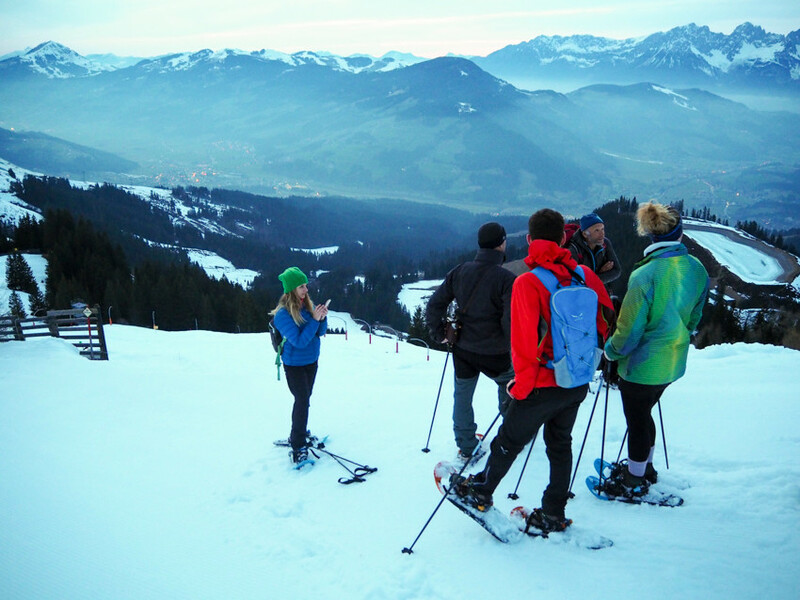 Kitzbühel offers a relatively long skiing season: its slopes can be used and enjoyed by skies or snowboarders from November thru May. The options are nearly unlimited: there are 68 slopes with a total length of 179 kilometers. Although the weather was surprisingly warm during my trip (4°C, even up in the mountains! ), there was enough snow to do skiing (some natural and some artificially made). Some of the lower slopes ending in the valley weren’t open yet, but luckily, most of the slopes are located in the upper portion where there was plenty of snow. If you are looking to do some spring skiing as well, I recommend taking off to the slopes early in the morning. This is when the ski conditions are at their best; later in the day, the now starts melting and the surface of the slopes can get messier and more difficult to navigate. Despite the advice from my ski guide, I still continued skiing in the afternoon – yes, you can do it, but you gotta be a bit careful. During my stay, I got to try two ski resorts directly adjacent to Kitzbühel. 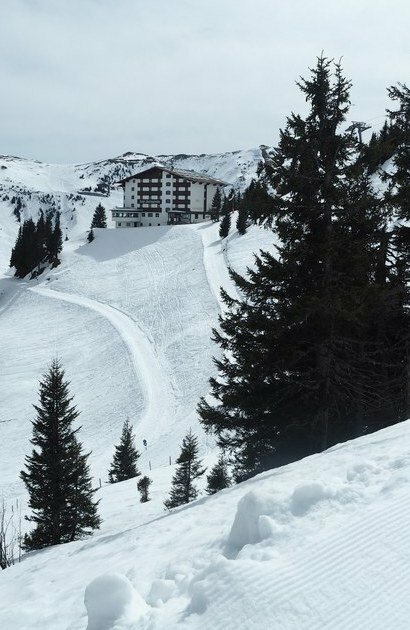 Both Hahnenkamm and Kitzbühel Horn are easily accessible from the town, with ski lifts just 10 minutes’ walk from the city. Honestly, I think this was the nearest to the slopes I have ever stayed! In the morning, you just have your breakfast, pick up your skies from the storage room – and it’s time to hit she slopes! Resort Hahnenkamm (1712 m) is located southwest of Kitzbühel. You can hop on the Hahnenkammbahn gondola and in a few minutes you are up in the hills with access to nine slopes. Despite its reputation for adrenalin, I can confirm that skiing in Hahnenkamm is suitable even for an intermediate skier. It might not be the best for beginners, but I only go skiing once or twice a year, and I could still manage. The pride of Hamnenkamm is the Streif, the most famous and most dangerous ski-run in the world. It is 3312 meters long, with a vertical descent of 860 meters. The run starts at 1665 meters above sea level. The average incline of the route is 27 per cent, with some particular spots where it goes as high as 85 per cent. Racers can reach a speed of up to 140 kilometers per hour – I can’t even imagine that speed on skis! 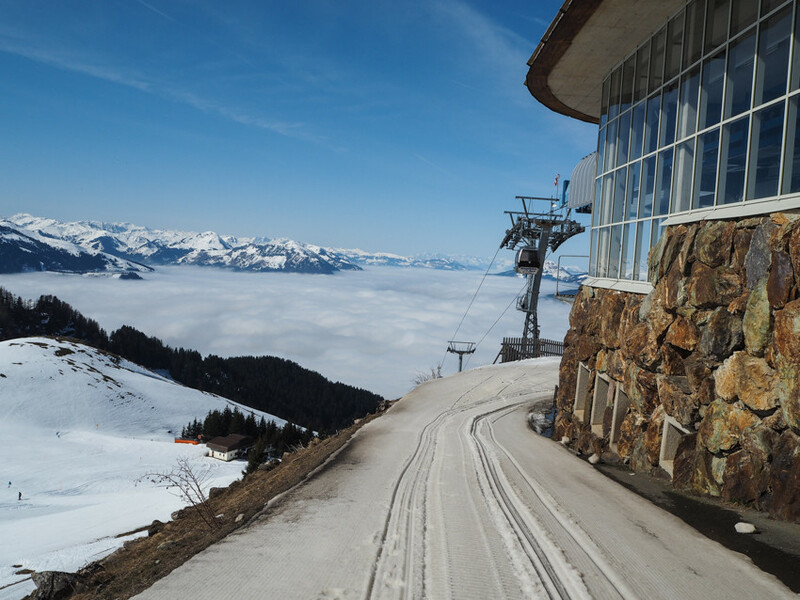 Only some parts of the Streif ski-run are open the public, and these are only suitable for experienced skiers. There is an easier version, the Familienstreif (or “family Streif”) that bypasses the most difficult section via a red (intermediate) run, with an intermediate difficulty. Choosing the right piste: If you are experienced, the northern slopes of Steibergkogel are the place for your to show off your skills. Intermediate skiers should start at Ehrenbach and then continue down the valley, following the red and blue runs to Kirchberg. Food tip: Try the Berghaus Tirol Ski Lodge right under Ehrenbach. Their Cremeschnitte dessert it simply amazing. Opposite Hahnenkamm, the sharp summit of Kitzbüheler Horn (1965 m) rises above the city. 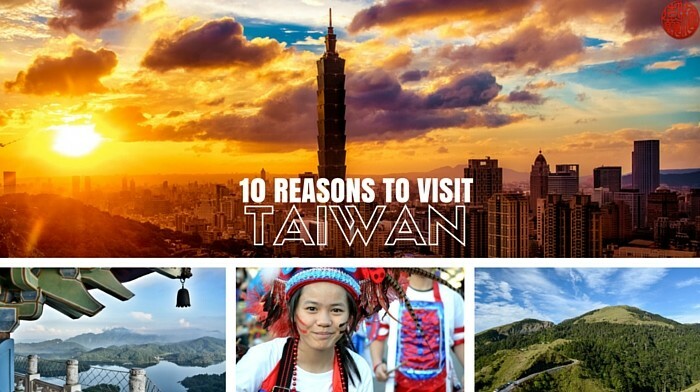 Its main slope is stretches for 7,1 kilometers, with a 1195-meter elevation drop. This resort isn‘t as popular as Hahnenkamm, so there were far fewer people on the pistes – and I never had to wait for the lift. You should not miss the majestic 3S-Umlaufbahn, one of the world most expensive gondolas. It crosses a 2,5-kilometer-wide and 400-meter-deep inaccessible valley between Pengelsteinem and Wurzhöhe. You will recognize it at first sight thanks to its size: one car one car can transport 24 people at a time. Kitzbüheler Horn is a favorite area for snowboarders; owing to its conical shape, the mountain is just about perfect for snowboarding! The best parts are around Kaseralmmulde and also two modern snow parks, where you can practice even the most difficult tricks. Choosing the right piste: The turned away side of Kitzbüheler Horn features one red (intermediate) run. The sunny side around Trattalm features several red and blue (easy) runs. There are several runs leading to the valley including a black (expert) one. 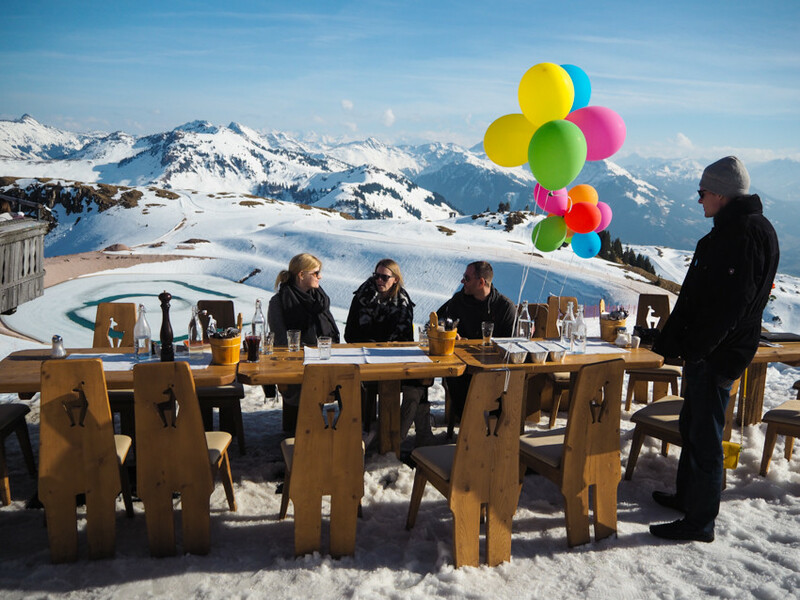 Food tip – Make a stop at the legendary Hornköpfel Hut. The food is very tasty plus they offer great outdoor seating. Kitzbühel is all about skiing, but once you get enough of the endless slopes, there are other things to do. The city itself is interesting as well – it’s quite compact so you can explore the main sights in just half an hour. Kitzbühel turns into madness each January, when the best ski racers, as well as masses of tourists come to town for the famous Hahnenckamm race. At other times, this medieval town of 8200 inhabitants remains rather quiet. 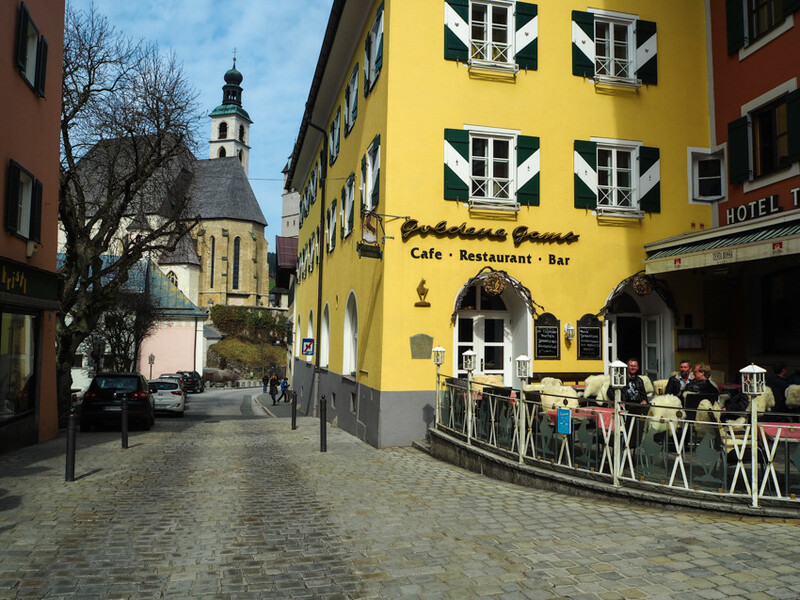 Kitzbühel features several churches and makes for a nice stroll: the main street is lined with historical houses featuring colorful facades. The shop windows display expensive high-end goods, reminding visitors that Kitzbühel is really an exclusive resort geared at guests that can afford some luxury. Rather than spending a fortune on clothing and accessories, find some local café or restaurant with outdoor seating and enjoy the atmosphere. There are nice places to walk and enjoy the greenery – head to St. Catherine’s Church (the one with the highest tower), and stroll out of town and continue on to the pastures. It’s easy: if you can manage walking, you can manage snowshoeing as well. The local tourism office organizes free tours twice a week. The meeting point is at 9:45 at the office. 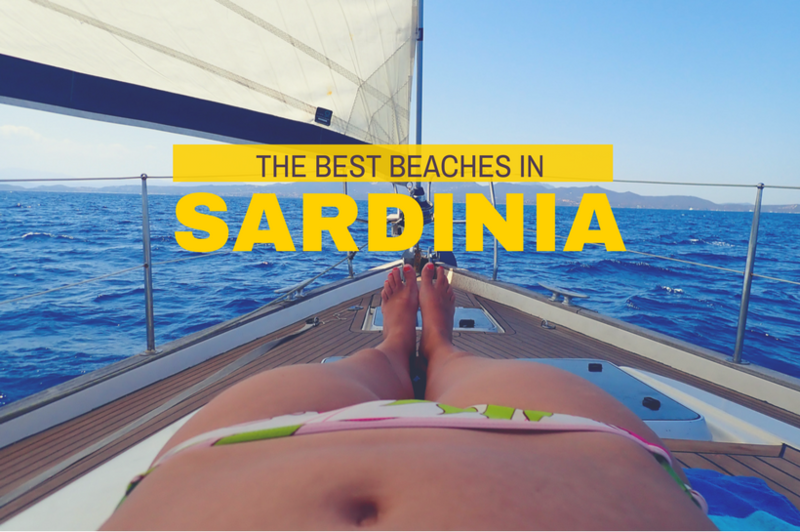 The trip is free so the only thing you need to pay for is the showshoe rental (EUR 12). You can also organize your own trip following one of many routes. I took the Hahnenkammmahn gondola and did a snowshoeing tour up one of the mountains. It was a bit exhausting going uphill but fun. This activity is best when there is fresh snow, since the snowshoes make it possible to move off the main routes as well. On a clear day, this alpine lake is an amazing place to explore. It is situated in a swampy area whose rich mud content gave the name to the lake (‘schwarz’ means black). 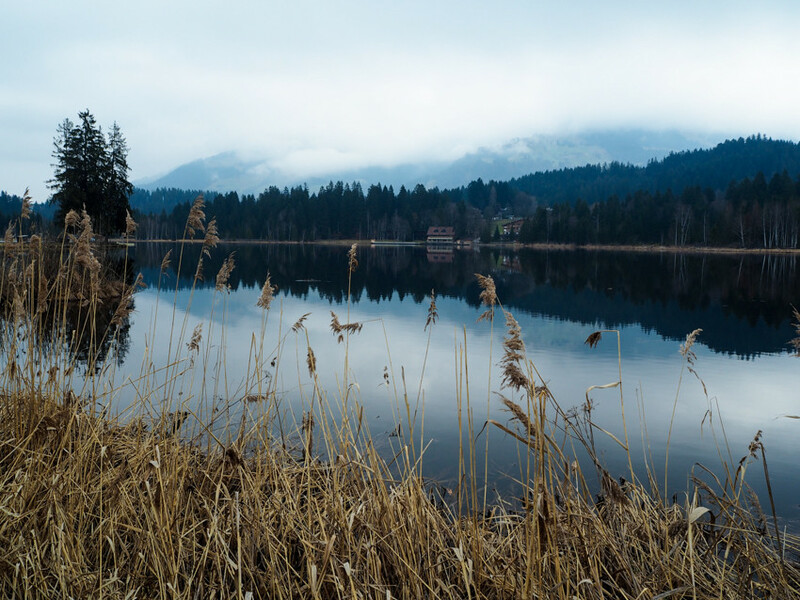 Schwarzsee is surrounded by greenery, with spruce trees reflecting on its surface, making the lake look green rather than black. In combination with the massive Kaisergebirge mountains in the background, this place is a truly scenic spot. The lake is located 2,7 kilometers from Kitzbühel. It takes 35 minutes to walk there. Another option is to take a horse driven carriage – you can arrange the excursion in the city center (there is always one or two carriages waiting in the streets). The trip costs EUR 70. If you are a cross-country skiing enthusiast, you will definitely enjoy Kitzbühel. To be honest, I did not have the energy to try cross-country skiing after I already did downhill skiing, so I am interested to do it next time. There are 36 kilometers of marked and maintained cross country skiing trails. You can even do cross-country after it gets dark. There is a lit-up route with artificial snow making facilities along the Golf Club Kitzbühel – Schwarzsee – Reith route. If you are into more extreme stuff, you should give the alpine route near Pass Thurn a try. With an altitude of 1200 meters, it guarantees amazing views! Needless to stay, the accommodation prices match the exclusivity of this resort. During my trip, I stayed in the comfortable Tiefenbrunner hotel, but more recommendations are included below. Choose your favourite one! SnowBunnys BackPackers Hostel – one of very few hostels in town. If you are on a budget, you have better book ahead. Reviews and prices are here. Tiefenbrunner hotel – my hotel, I can recommend it. Located directly in the center, it has been in the same family for 200 years. They’ve got an amazing historic restaurant and wellness center including pool and Finnish sauna. Reviews and prices here. Rasmushof – located directly at the golf course at Hahnenkamm Mountain. Rooms feature balconies. There is a wine cellar with a great selection of wines. Reviews and prices here. Rosis Sonnbergstuben – the hotel is situated above the city at 1200 meters above sea level. The owner, Rosi Schipflinger, is a famous folk music singer and often performs at the restaurant for guests. Reviews and prices here. DO YOU LIKE SKIING? HOW OFTEN DO YOU SKI? When I was little, I used to go on ski holidays with my parents each winter. But the mountains in the Czech Republic are much lower than the Alps. Nowadays I just go skiing once a year and I really appreciate proper ski resorts offering various slopes. How about you – can you ski? And where do you usually go skiing? 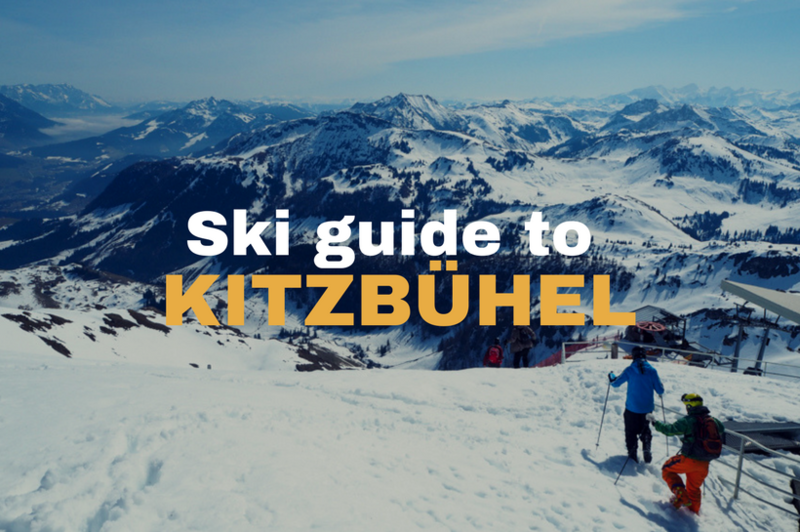 If you have your own tips for Kitzbühel, feel free to include them in the comments. My trip was in cooperation with Tirol Tourism board. Cool, Kirchberg is just next door! Amazing place. I’m more in interested in snowboarding. However, I would love to go there. Even if you don’t do any kind of winter sports activities, I think is a great place for relax. I can agree. I have been to area also in the summer and I love it as well when everything turns green. Kitzbühel is so pretty! I don’t ski, but I’d love to try snow shoes…it looks like a good compromise for someone like me! Wow! The photos look incredible. Is snowboarding as big as skiing in the area? I love the colorful shots of the town but the scenic mountains are something else. I’ve not done a lot of skiing but this place looks amazing! I would love to get more experience and become a better skier here. Your shots are gorgeous. Kiwi.com? Never heard of it! Will have to check it out! I’m not very good when it comes to skiing/snowboarding (I’ve learned this the hard way) so I think snoeshoeing and exploring town would be more my speed. Plus 53 euros is not bad for a ski pass! No worries, there is a lot of things to do for non-skiers as well! Love Kitzbühel – such a beautiful medieval town on top of being a fab destination for snow sports 🙂 I’m going to go ahead and say it’s the most beautiful ski town in Europe! Wow what a beautiful ski resort and town. It’s actually colourful as compared to Vienna which is rather off white and grey. I haven’t been skiing in several years. I think Austria is good place to get back to it again. 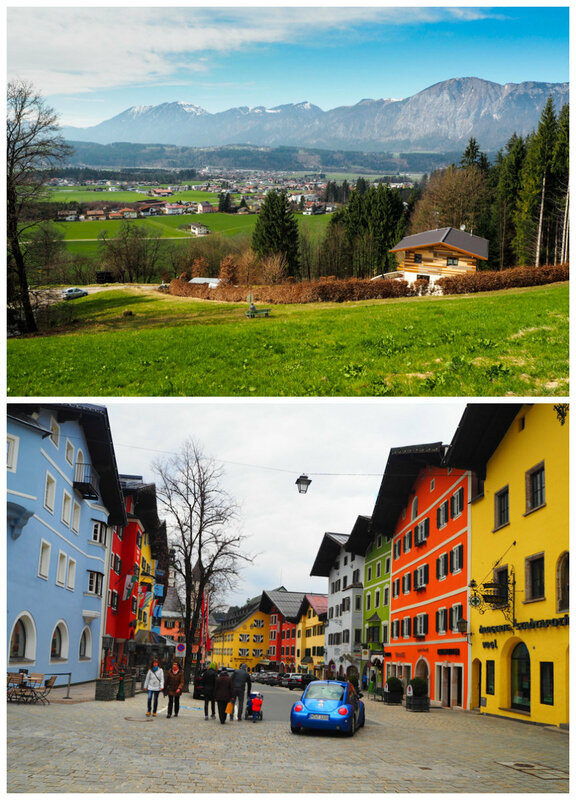 Great tip on three airports to fly into, Salzburg, Innsbruck or Munich. What a nice variety of snow activities and a beautiful mountain to ski on. Your photos are beautiful. I’m not a winter fan, so I prefer the color green over white. In all seriousness, I’m glad you had a great time! Yep you can get there from all tree places. It definitely is. And the scenery is amazing! I love skiing even though I’m a very average skier. I just love the white winter wonderland scenery and the mountains have an incredible energy. Kitzbühel looks so pretty.